Is Iran Considering Reactivating Uranium Enrichment at Fordow? 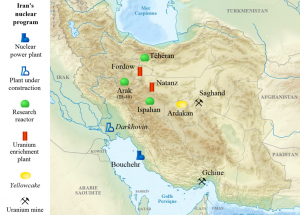 EXECUTIVE SUMMARY: On April 29, satellite imagery showed irregular activity at Iran’s Fordow uranium enrichment facility, arousing suspicion that Iran is preparing to resume its activities. The Iranians had indeed threatened to do this if President Trump followed through on his plan to quit the 2015 nuclear agreement (the JCPOA). However, the unusual activity might simply be steps towards converting the facility to a civil research center for nuclear energy and physics, which would comply with the JCPOA. The Fordow uranium enrichment nuclear facility was one of the Iranian clandestine nuclear projects displayed in Israeli PM Benjamin Netanyahu’s “nuclear speech” on April 30. The day before the speech, irregular activity at Fordow was detected in a satellite image taken by the EROS-B (Earth Remote Observation) satellite. (EROS-B was manufactured by Israel Aerospace Industries and is operated by Israel’s ImageSat International [ISI]). The photos showed that the entrance gate to the tunnels leading to the plant had been opened, and about thirty private cars and four buses were in the parking lot close to the entrance. This differs from recent months, when ISI photos showed the plant gate closed and no vehicles in the lot. The new photos also showed that two buildings that had been under construction in July 2016 are now completed and ready for use. The buildings are believed to be workshops for R&D and assembly. The IAEA (International Atomic Energy Agency), which is responsible, according to the 2015 JCPOA agreement, for monitoring Iran’s nuclear facilities and activities, is committed to regular inspections of the Fordow facility. In its quarterly verification and monitoring report released on February 22, the IAEA said with regard to Fordow: “Throughout the reporting period, Iran has not conducted any uranium enrichment or related research and development (R&D) activities, and there has not been any nuclear material at the plant.” However, IAEA has not yet responded to the new satellite photos of Fordow. Fordow is located deep inside a mountainous zone about 32 km northeast of Qom. It is part of Project Amad, the Iranian nuclear weapons effort. Its construction by the IRGC (Islamic Revolutionary Guard Corps) began in 2006-07, and it went into operation in December 2011. The secret gas centrifuge enrichment facility was designed for the purpose of enriching uranium for nuclear weapons. However, after its existence was exposed by Western intelligence services in 2009, Iran was forced to acknowledge it to the IAEA. Ever since then the facility has been subject to IAEA inspection. Iran stated in October 2009 that the purpose of the Fordow facility was to enrich uranium up to 5%, the level of enrichment required for the nuclear fuel used in power reactors. In June 2011, Tehran changed its mind and informed the IAEA that the facility would be used to enrich up to 20%, the level required for nuclear fuel used in research reactors. This was to be accomplished by feeding Fordow’s centrifuges with uranium that had been enriched beforehand at the Natanz plant. Although 20%-enriched uranium is still not weapons-grade, a large accumulation of 20%-enriched uranium can be a springboard for 90% enrichment, which is weapons-grade. Fordow was built to contain up to 2,976 centrifuges of the IR-1 type, Iran’s first-generation gas centrifuge, which was designed to be installed in 16 cascades. In fact, until the signing of the JCPOA, in which Iran agreed to curb its nuclear program and close Fordow, the number of centrifuges installed there was only 2,710. When Fordow was brought into operation, only two cascades were active. Two more cascades became active in January 2012, bringing the number of operating centrifuges at Fordow up to 696. But in accordance with Geneva’s interim “Joint Plan of Action” (JPA) agreement of November 2013, Iran ceased enriching uranium to 20% in January 2014. Moreover, all the 20%-enriched uranium accumulated by Iran up to that point was either converted for production of nuclear fuel for Tehran’s research reactor or downblended with natural uranium into lower than 5%-enriched uranium. The quantity of 20% enriched uranium sufficient for casting a nuclear weapon core, following a further enrichment to 90%, is about 150 kg. That is less than the 166 kg 20% enriched uranium produced at Fordow between December 2011 and January 2014. Iran also produced 136 kg 20% enriched uranium at its Natanz enrichment plant between February 2010 and January 2014. Had Iran been able to use all its 20%-enriched material for a nuclear weapon, it could have had, within one or two months, a quantity of 90%-enriched material sufficient for two nuclear weapons. It was stated in the JCPOA agreement that “the Fordow Fuel Enrichment Plant (FFEP) will be converted into a nuclear, physics, and technology center” and that “Iran will not conduct any uranium enrichment or any uranium enrichment related R&D (Research and Development) and will have no nuclear material at the Fordow Fuel Enrichment Plant (FFEP) for 15 years”. With regard specifically to Fordow, Iran committed itself to maintaining no more than 1,044 IR-1 centrifuges there for 15 years, and those centrifuges will be disconnected from their UF6 pipework (UF6, or uranium hexa-fluoride, is a uranium-fluorine compound that is fed as gas to the enrichment system). Three hundred forty-eight centrifuges that have not been used for enrichment will be modified for the production of stable isotopes in joint partnership between Russia and Iran, and all excess centrifuges at the facility and their infrastructure will be moved to the Natanz plant for storage. And finally, “Iran will permit the IAEA regular access, including daily as requested by the IAEA… for 15 years”. Under the terms of the nuclear agreement with Iran, two-thirds of the centrifuges inside Fordow have been removed in recent months, along with all nuclear material. The facility is banned from any nuclear-related work and is being converted to other uses. Further, according to the 8th of September 2016 quarterly IAEA report on Iran, two of the 1,044 centrifuges that remained installed at Fordow after “Implementation Day” were removed from their x cascade, modified and installed separately for the purpose of conducting “initial research and R&D activities related to stable isotope production”. Moscow has a significant role under the JCPOA in realizing Fordow’s project to separate stable isotopes. On January 20, 2017, Russia and Iran signed documents furthering their cooperation in the peaceful use of nuclear energy. Those documents referred, inter alia, to the stable isotopes project at Fordow. In connection with this, Iranian delegates traveled to Russia and Russian experts to Iran, including Rosatom consortium experts who arrived at Fordow on February 4 to begin installation of equipment. The Rosatom consortium is one of the leading organizations of Russian nuclear energy projects. It is involved, among other things, in the Iranian Bushehr nuclear power station. At a meeting in Tehran on April 25 attended by Nikolay Spassky, deputy director general for international relations of Rosatom, and Behrouz Kamalvandi, spokesman for the Atomic Energy Organization of Iran, the two exchanged views on the current status of the countries’ joint projects, including the second and third power reactors at Bushehr and the rebuilding of Fordow to produce stable isotopes. On August 15, Rouhani said, “In an hour and a day, Iran could return to a more advanced nuclear level than at the beginning of the negotiations”. Also, the head of the Atomic Energy Organization of Iran, Ali Akbar Salehi, said on August 22 on Iranian state television: “If we make the determination, we are able to resume 20% enrichment in at most five days”. On October 30, he added: “We can produce 20%-enriched uranium at Fordow in four days, but we don’t want the nuclear deal to collapse”. On March 5, Kamalvandi said to Tehran’s Arabic language al-Alam TV: “If America pulls out of the deal … Iran could resume 20% uranium enrichment in less than 48 hours”. Given the lack of technical information on the essence of the stable isotopes project, it is impossible to understand what this is about. From a technological standpoint, the possibility of converting Fordow’s centrifuges, which are designed for uranium enrichment, into equipment to be used for the separation of stable isotopes is quite doubtful. It is probably easier to convert a tank into a tractor. Also, the nuclei of stable isotopes in medicine, agriculture, and industry are light, some of them far lighter than the uranium nucleus. Further, the chemical properties of stable isotope compounds differ from the UF6, which would make it necessary to install different feeding systems for stable isotope compounds at the Fordow facility. The part of the JCPOA that deals with stable isotope separation at Fordow is thus either nonsense or deception. The unusual activity photographed by the satellite on April 29 can be explained as organizing steps for converting the facility to a civil research center for nuclear energy and physics, conducted in partnership with Russia, which would comply with the 2015 nuclear agreement. Careful monitoring of the Fordow site is highly important, particularly after Trump’s decision to pull out of the nuclear deal, but we must not be tempted towards hasty conclusions. Lt. Col. (ret.) Dr. Raphael Ofek is an expert in the field of nuclear physics and technology, who served as a senior analyst in the Israeli intelligence community.